Xiaomi will soon launch the Redmi Note 7 smartphone in the Indian market, according to a tweet by the company’s country head Manu Kumar Jain. The Redmi Note 7 is the brand’s first (and presently only) smartphone with a 48-megapixel camera, which Jain alluded to in his tweet. The smartphone is also the first model under the newly independent Redmi brand, though we don’t if the brand will be spun off in India as well. In Jain’s tweet, the inverted caption says, “We’re gonna turn this industry upside down. Amazing #48MP is coming! RT if you know what this is.” The caption is accompanied by an image of Jain and Xiaomi CEO Lei Jun, with the Redmi Note 7 in the latter’s hand. The tweet, however, does not give us a timeline around the handset’s launch. 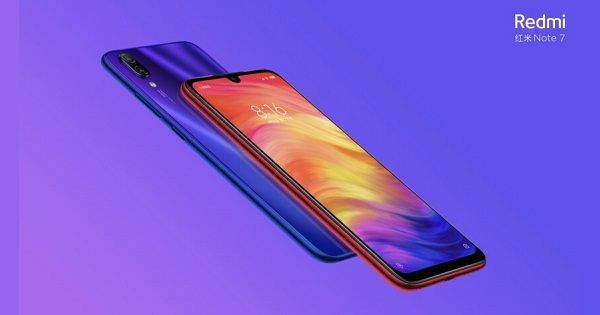 Xiaomi will also be launching the Redmi Note 7 Pro with a true 48-megapixel camera in China in early February. This camera will have a Sony IMX 586 sensor that can capture images in 48-megapixel resolution, unlike the Redmi Note 7’s Samsung G1 sensor that captures images in 12-megapixel resolution and then interpolates them to 48-megapixel. We can expect both the standard and the Pro models to be announced in India in mid-February — the former could be released just a week later and the latter in early March. The Redmi Note 7 series India launch is not a huge surprise due to the immense popularity of the Redmi Note phones in India. The company has been alluding to it for the last few days by retweeting fans’ tweets about the smartphone to show its demand in India. It is also possible the Redmi Go smartphone may be launched at the event as well. For specifications, Redmi Note 7 has a 6.3-inch display with full HD+ (1080 x 2340 pixels) resolution, a waterdrop notch, and 19.5:9 aspect ratio. It is powered by the octa-core Snapdragon 660 SoC with up to 6GB RAM and 64GB storage with microSD card support. It has a 13-megapixel camera in the front, while the 48-megapixel primary camera on the back is backed by a 5-megapixel sensor for bokeh effects. Other key features include the 4,000mAh battery and fingerprint sensor on the back. Redmi Note 7 prices are set as RMB 999, RMB 1,199, and RMB 1,399 for the 3GB + 32GB, 4GB + 64GB, and 6GB + 64GB variants, respectively. While not much is known about the Redmi Note 7 Pro specifications, it is rumoured to be powered by the Snapdragon 675 chipset. It will reportedly priced starting RMB 1,499 (about Rs 15,800).